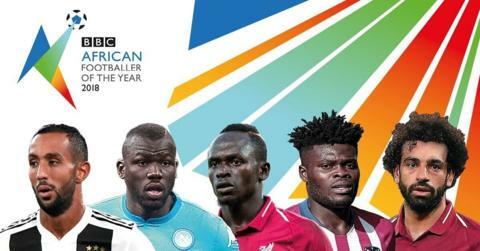 Voting is now closed for the BBC African Footballer of the Year 2018 award. Medhi Benatia, Kalidou Koulibaly, Sadio Mane, Thomas Partey and Mohamed Salah are on the five-man shortlist. You can read about their achievements this year below. Vote closed on 2 December at 20:00 GMT. Morocco captain Medhi Benatia, 31, has developed into one of Europe's most reliable defenders in recent years, having played for some of the continent's biggest clubs. But it has been his role at the heart of Juventus' famously secure defence in 2018 which has earned him a place on the BBC African Football of the Year shortlist for the first time. "He's an outstanding player," says Juventus team-mate Cristiano Ronaldo. Will it be a case of fourth time lucky for Senegal's Sadio Mane? Reds manager Jurgen Klopp says Mane has proved he is among the world's elite. "He's much more secure that this is his level," the German said in August. Ghana's Thomas Partey is another first-time nominee after the Atletico Madrid midfielder cemented his place as an important figure for both club and country this year. Now the Liverpool forward is aiming to be the first player to retain it since Nigeria's Jay-Jay Okocha in 2002. That helped the Reds reach the Champions League final and led to a host of personal accolades, including the PFA Players' Player of the Year and the FWA Footballer of the Year. In April, former Liverpool captain Steven Gerrard even described Salah as the "best player on the planet right now". Injury in the Champions League final against Real Madrid hampered his chances of making a real impact for Egypt in this summer's World Cup finals, but he has returned to Liverpool and scored eight times already this season.